Brousko Authentic Greek Cuisine in Schaumburg hosts great live entertainment weekly featuring talented vocalists and musicians straight from Greece. Guests on Mar 29 and April 12 enjoyed two wonderful nights of Greek music provided by singers Christina Rammou, Evgenia (see video), Manolis Opadis and bandmates performing on keyboards, drums, clarinet, flute and bouzoukia. Participants also dined on delicious items from Brousko's Mediterranean style menu. Brousko welcomes everyone to enjoy live music and dancing every weekend while enjoying delicious Greek items like Saganaki (OPA! 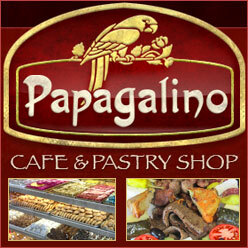 ), Pastichio, Roast lamb, Fresh Seafood, Chicken, Gyros and more. Open daily for lunch and dinner. Catering also available to accommodate any special event. Hellenic pride was on display at the 29th annual Taste of Greek town, a lively celebration of authentic Greek food, music, culture and fun. The family friendly event once again attracted many guests who enjoyed delicious food from Greektown's acclaimed Greek restaurants. Popular food items included Loukaniko (Greek sausage), Roast Lamb, Pastichio, Moussaka, Gyros, Greek Chicken, Kabobs, Spanakopita and much more! Visitors also enjoyed plenty of Greek music and entertainment plus games for both kids and families. Sts. Constantine & Helen hosted its annual Greek Fest of Palos Hills where happy crowds enjoyed delicious Greek food, pastries, music, dancing, rides for the kids and much more! Popular food items included Souvlaki, Gyros, Saganaki, Grecian Chicken and Spanakopita while assorted pastries included Loukoumades, Baklava, Kourambiethes and other favorites.